Our beloved Cat Leia went missing around Aug 20th from Schoolhouse Rd in Monroe Twp. 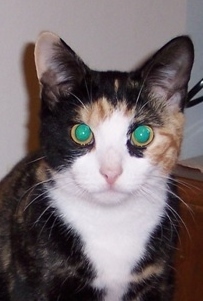 Leia is a Calico, spayed female cat who is around 6 years old. She is an indoor cat and has a collar and is micro chipped. She is an indoor cat who has been with us since she was only around two weeks old so we know she has no survival skills to live outside. Reward $500 offered to anyone bringing this cat home.